Your lymphatic system, often overlooked, forms the foundation of a supreme skincare routine. Resist promises of quick fixes and temptations to invest in complex routines, and instead focus on simple, proven means to purify the system and deliver increasing aesthetic results. Explore the science and application of lymphatic stimulation for deeper understanding of its astounding value. 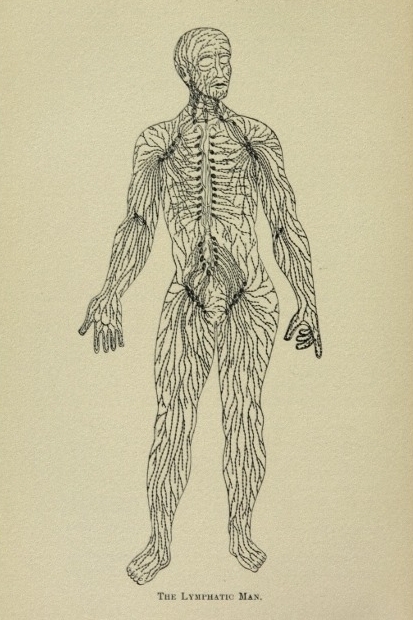 What is your lymphatic system and why should you stimulate it? Not only is it the most major part of your immune system, it is the foundation for keeping your body looking and feeling radiant. Strung along like pearls knotted on a string, the lymphatic system is an intricate net of organs, lymph nodes, lymph ducts, and lymph vessels. Within this intricate system, the lymph nodes act as a series of cleaning filters that produce and transport lymphatic fluid (clear or milky with fat) from tissues to the bloodstream. There is twice as much lymph fluid as blood, and twice as many lymph vessels as blood vessels. This entire system is a network of filtration ducts that continuously bathe and detoxify each cell from mutations, viruses, toxins, fats, heavy metal residues, pollutants from the environment, and a variety of stress related hormonal secretions. A healthy lymphatic system prevents waste buildup, fluid retention and increased cellular aging. The lymphatic system also maximizes your body’s ability to internally absorb vitamins for healthy skin, hair, and nail growth and acts as a vital assist for your respiratory system. Have you ever had swollen tonsils? Those tonsils are major lymph nodes that have identified a threat (such as allergens; mutated cells; and pathogens) and are cleansing them. Whatever the threat, our lymph nodes increase white blood cell production, which causes the nodes to swell, become noticeable, and sometimes painfully inflamed. Once the white blood cells have the threat contained, it breaks it apart to be flushed out through the lymph. A healthy body filters approximately a half a gallon of lymph per 24 hours. Like tributaries trickling into a stream that feeds a slow-moving river, the lymph system transports lymph fluid through ever-widening vessels, moving it through 500 filtration and collection points - your lymph nodes. With stress, aging, pollution, and lack of stimulation, debris can build up and block your lymphatic flow. Sometimes lymph can take a detour, but when blockage is extreme it can cause swelling in the surrounding tissue, a condition known as lymphedema. Lymphedema is when a block in your lymphatic system occurs. Your limbs and facial features can become large, swollen and numb until the body is able to process and clear the blockage. Lymphatic blockage over time encourages the accumulation of extra fat cells, and prevents essential nutrients and blood from rejuvenating cells. This can result in cellulite, sagging skin, swelling and deposits resistant to diet and exercise. There are many practices proven to cleanse and drain the lymph; adequate body movement (exercise/breathing), proper hydration (to keep cells from becoming thick and static) and physical stimulation in the form of a LYMPHATIC MASSAGE all employ lymphatic flow. A lymphatic massage is the perfect medium to break up excess fat cells, resolve lymphatic blockages, sculpt away toxic deposits, and flush out water retention. Most importantly it will allow your body to regain the important immune system network, so that you are better equipped to fend off the daily barrage of unwanted toxins from everyday life. Our lymphatic system plays a critical role in the development and reduction of Cellulite. Cellulite occurs when bundles of fat are trapped just beneath the skin. They push upwards between walls of fibrous, firm connective skin cords called septa. Septa becomes stiff and rigid with decreased lymph and blood circulation to the skin. When your septa becomes rigid, there is often a noticeable dimpled appearance, especially when flesh is squeezed or skin thins with age. Over time, the tissue weakens; the decrease in lymph drainage causes the fluids that should carry away waste to be trapped. As more fluids and toxins gather, the septa can become fibrous and continue tightening on the underlying fat cells. A vicious cycle of stagnation and collection ensues, like a dam in a river. The decreased circulation also weakens capillaries and veins, causing the surrounding tissue to harden. Subsequently blood reroutes around the cellulite area as the septa fibers continue to thicken, prompting even more fat collection. Unless the lymph and circulation are stimulated; breaking up and flushing the toxins and fat cells, the cycle of buildup will continue. The area may become cold, tender or painful; bruise, sag or wrinkle easily. For men, cellulite is typically not apparent. Septa tissue in men is crossed in an X formation, versus women which have vertical septa tissue. When men’s septa tissue contracts, cells tighten into a more compact deposit. Though they remain free of the beloved tufted mattress look, it is still important for men to flush and detox any blockages in the system.